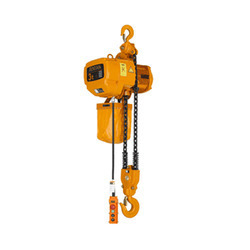 Our association is broadly known for maintaining the quality in offering Motorized Chain Hoist. 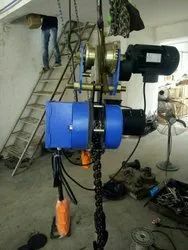 Our company is among the top supplier and trader of high strength Electric chain hoists in the market. These electric chain hoists are designed to maximize productivity with fast installation, easy operation and built-in durability. The compact hoist design provides low headroom and allows close trolley approaches. 'ELEPHANT' Brand Chain Electric Hoist are designed for higher factor of safety. All components are precision made and assembled with great care by use of jigs and fixtures for noise less operation. We provide electric Chain Hoists Services . We can build light duty overhead cranes with chain Hoists on it.The system is to reduce usage of human efforts for repeatative jobs. The system can be built from manual operations for all three axis to electrical operations (mechanized) for all three axis as per requirements of clients. Our entity is ranked amongst the reputed names in the market for offering Chain Hoist. We offer this product at nominal costs.